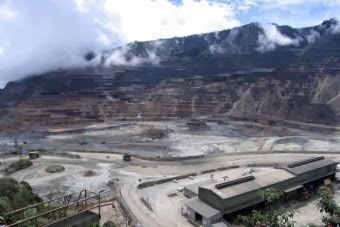 The Prime Minister and Members of Parliament from the Western Province have been given 48 hours to respond to the demands of the mine affected villages or the Ok Tedi gold mine will shut down. Representatives from the Community Mine Continuation Agreement held a conference yesterday in Port Moresby saying their cries have hit brick walls and it is high time the people stand up and make their point clear. They demand that the Sixty-three Point Four percent stripped off PNGSDP by the National Government be paid in full to CMCA and mine landowners. They said the demands laid out represented over one hundred thousand people from the mine affected villages from the North, Middle and South Fly including the mine landowners. They demanded the Prime Minister and their local MPs and Governor to provide them the Sixty-three Point Four percent as they claim is compensation money, the national government and investors owe the people of Western Province. They said they have lost confidence in the Provincial and National Government because they have not provided the much needed services over the years and through the mine life. The 48 hours ultimatum will be effective as of next Monday. Starting today, the leaders will carry out awareness in Daru, Kiunga and in their respective communities. On Wednesday a meeting will be hosted to gain the views of the all the communities and an action plan on how the mine will be shut down will be executed. They have given an open invitation to the Prime Minister, their three local MPs and Western Province Governor, Ati Wabiro, to participate in this crucial meeting. They will also hold talks with the mine workers’ union. Also in the interim, they demanded an immediate transfer of the 2.5% shareholding plus any other outstanding commitments of 2006 and 2007 CMCA reviews granted by NEC decision Number 272 of 2006.